Cardinal Health, Inc. (CAH) is a global, integrated healthcare services and products company, providing customized solutions for hospitals, health systems, pharmacies, ambulatory surgery centers, clinical laboratories and physician offices worldwide. The company provides clinically-proven medical products and pharmaceuticals and cost-effective solutions that enhance supply chain efficiency from hospital to home. Cardinal Health connects patients, providers, payers, pharmacists and manufacturers for integrated care coordination and better patient management. 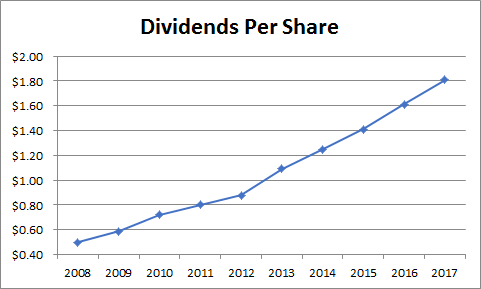 Cardinal Health is a dividend aristocrat, which has managed to reward shareholders with a dividend increase for 34 consecutive years. The last dividend increase was just last week, when the board of directors approved a 3% increase in the company’s quarterly dividend to 47.63 cents/share. This was the second dividend increase in a row of 3%. The slow rate of recent dividend hikes for two years in a row suggests that management sees turbulence ahead for the company’s business. Cardinal Health has delivered an annualized total return of 5.18%/year over the past decade to its shareholders. The returns over the next decade could be better than the growth rate of earnings per share, due to the low valuation today. 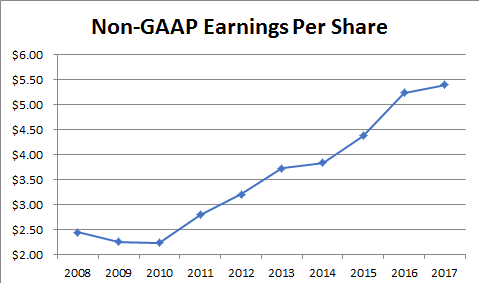 The company has managed to grow GAAP and Non-GAAP earnings per share over the past decade. Due to acquisitions, there are several recurring items related to amortizations and other acquisition related costs, which impact earnings per share by over $1/share per year ( in addition to a few other one-off items, which are relatively small in comparison). Cardinal Health Managed to grow earnings per share from $2.45 in 2008 to $4.03 in 2017; it grew non-GAAP EPS from $2.45 in 2008 to $5.40 in 2017. The average expectations are for EPS of $5.42 in 2018 and $6.06 in 2019. Given the slow rate of recent divided hikes, I believe that earnings per share will be more modest over the next 3 – 5 years. Earnings per share have also been aided by share buybacks, as the number of shares outstanding declined from 364 million to 317 million between 2008 and 2018. Cardinal Health, along with its competitors AmerisourceBergen (AB) and McKesson (MCK) control 90% of the market for pharmaceutical and related medical supplies. In order to gain entrance into drug distribution, a new company has to invest a large amount of funds, until it can get the scale and spend the time building the relationships with manufacturers and customers that these three companies have achieved. The massive scale of each company allows them to obtain pricing discounts from manufacturers. The company then turns around and distributes those pharmaceuticals and medical supplies in an efficient way to its clients. Distribution of pharmaceuticals is a very intensive and low margin business, which is one reason perhaps why it would be difficult for a new entrant to get into the industry. Historically, the company generated profits as a percentage of sales of drugs it distributed. As prices for drugs went up, profits went up. Unfortunately, as the healthcare industry has been in the spotlight over the past three years, there is increased scrutiny over pharmaceutical companies and distributors. Those pricing pressures could reduce profitability, given the already thin profit margins. Pharmaceutical spending is expected to continue growing at a healthy clip, as population ages, new drugs come to market to treat various illnesses and the number of individuals covered by health insurance increases. Over the past year, many healthcare distributors and drug store chains saw declines in share prices on fears that Amazon.com would enter the pharmaceuticals market. We discussed in a previous article that Amazon had found it difficult to sell and distribute pharmaceutical products. Amazon has not been able to convince big hospitals to change their traditional purchasing process, which typically involves a number of middlemen and loyal relationships. The health-care supply chain is well-entrenched and will be hard to break into. The hospital and health-care systems have entangling alliances with their existing purchasing and supply chain partners. Between 2008 and 2017, the company grew its annual dividends from $0.50/share to $1.81/share. Future dividend growth will likely be more subdued, given the increased competition. 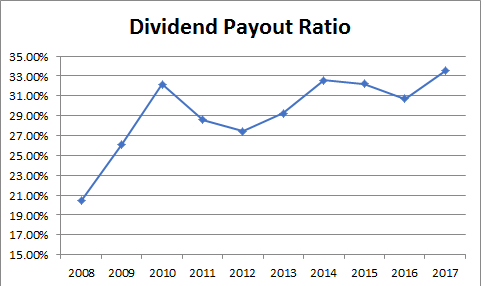 The dividend payout ratio has increased from 20% to 33% over the past decade. The low payout ratio leaves room for further dividend increases down the road. It also provides an adequate margin of safety in dividends when the inevitable turbulence affects the business. Currently, Cardinal Health is attractively valued at 10 times forward earnings and yields 3.50%. The dividend is adequately covered from earnings. The issue is that near term earnings per share are not expected to grow by much. This is evidenced by the slow rate of recent dividend increases. In other words, slow growth is baked into the business. However, if something changes for the better from here, investors may end up generating a fairly decent return on investment. I like that you are paid to wait for a turnaround a well covered yield of 3.50% today.